This beautiful gift would make a perfect lasting and deserving memorial to your Loved Ones. Poem Reads: as shown on the photo. BEAUTIFULLY GIFT WRAPPED FOR THAT EXTRA SPECIAL TOUCH! 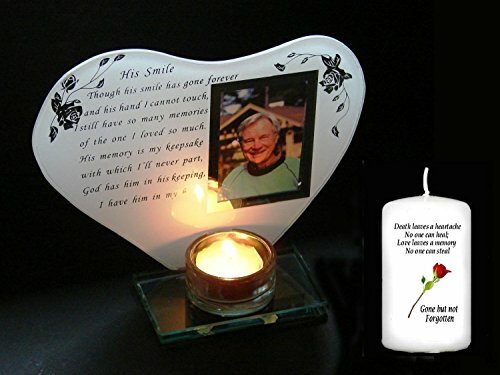 GLASS TEALIGHT MEMORIAL KEEPSAKE GIFT This beautiful gift would make a perfect lasting and deserving memorial to your Loved Ones. Poem Reads: as shown on the photo. Measurements Approx: 7" height x 8" width x 2.5" depth BEAUTIFULLY GIFT WRAPPED FOR THAT EXTRA SPECIAL TOUCH!